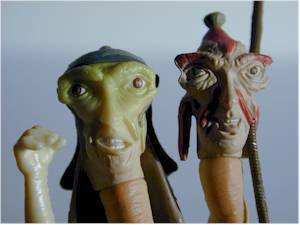 You either love them or you hate them - the sports announcers Fode and Beed from the Phantom Menace. Sure, they were pure cheese, but some folks found them hilarious. Now we have a 3.75" version of the annoying pair available at most retailers for $6-$7. The are showing up at Wal-Mart's mostly, but Target and Meijers is getting in on the act as well. This is the second version of Fode and Beed. 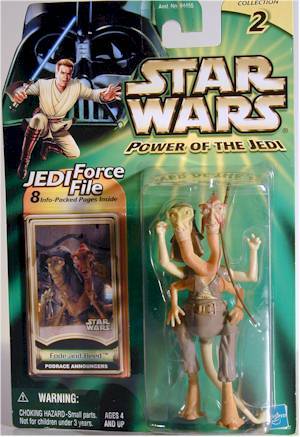 The first was released in a Beast set with Jabba the Hutt, but that version is rather rare, particularly the U.S. version of the box. Alright, I'm growing tired of the package already. Maybe that's just because there's been a dozen new figures popping up in recent weeks, and the pegs are filled with these carded figures once again. Hopefully, the Christmas season will help Hasbro turn a profit. Another fine example of no accessories. What, we don't even get a microphone? They could have repackaged that silly mic from the Cantina singer, but no, we get jack. Yuck. The color of the faces doesn't match the rest of the body, so they look completely out of place, and they certainly don't look like the art work we get provided on that valuable little piece of paper included. 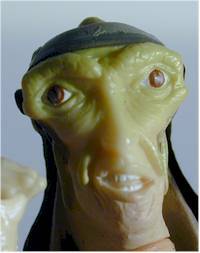 Here's a shock - a Star Wars figure with lousy paint and sculpting, but great articulation. We get ten points this time - one on each neck, one at the bottom of the neck, one on all four shoulders, the hips and the tail. Too bad they wasted this articulation on an otherwise poor figure. Once again we're paying seven bucks for practically nothing. Too bad Hasbro isn't profiting from the ridiculous price point. I buy all the aliens. 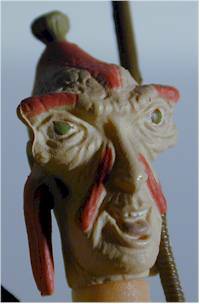 That is the only reason I have this particular figure. Sometimes that particular compulsion makes me feel much like a man who puts his money through a paper shredder. This is one of those times.